This is part 2 of an on-going series. Start here if you don’t know what’s going on. Last week I spent most of my time working on a school assignment, but I still managed to find some time to cram in some new features into this fancy indie game I’m making. 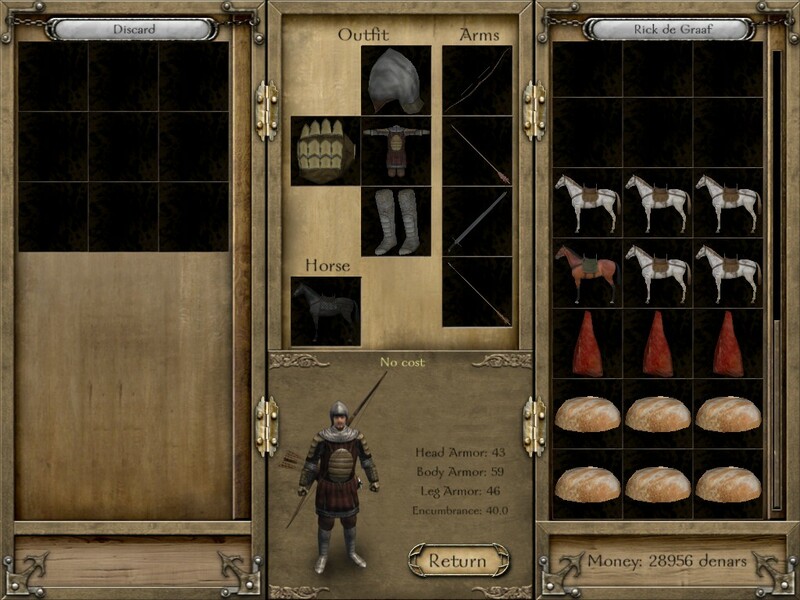 But most of all, I spent time playing one of my favorite indie games of all time: Mount & Blade: Warband. So I want to start this blogpost with a critique of that game. What’s so bad about MB:W? When looking for comments about it online, you’ll find a lot of people talking about the first person combat, and not a helluva lot of talk about the third-person world overview. Even though you’ll be spending close to 70% of your time in it! The way it works is that you get an iconic representation of your party: a horse with a dude on it with a number representing its movement speed. All the other parties get the same treatment, so you can start fights by colliding with them. However, that is just one way to get rich. You can also try your hand at trading, where you buy goods for cheap in a village or town and sell them in another town where the demand for that good is high. Of course you’ll have to factor in that some goods will lose value as they get eaten or start to rot, so to get rich you have to focus on the unspoilables like salt, velvet, tools and furs. But how do you know if the price you’re getting for an item is amazingly cheap or horrifyingly expensive? What is this, EVE online? After a while, you start seeing patterns. For instance, if you see grain at <10 denars, you should always buy it. 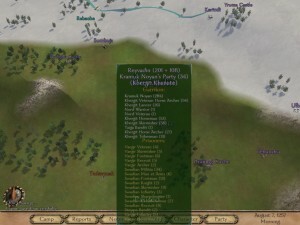 That's because can sell it to most towns and villages for 20-30 denars. But then get another problem: the game tells what for, but doesn't tell how much paid in first place! 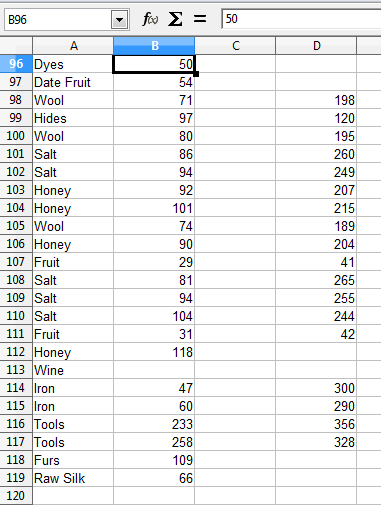 So spreadsheet also has a column selling price see that grain is quick profit, it's never much. However, if iron <70, ~300 A huge profit! And would be nice actually told about these things. If let discover workings of local economy, help make profit without bloodshed. But enough this hugely popular successful built by two people an apartment. Let's talk new features PostApocalypse! This proved to be quite the headache. How do you store game state in a file? Well, remember how I talked about MVC last week? That model is very, very handy when you want store only the state of the game and not any additional fluff. You simply store the variables in the Data modules, because you don’t have to care about the rest! This looks fine, but it has a problem. These guys can explain it much better: Engine Tech: Concurrent World Editing. They talk about the problems they had with their save file system and how they resolved it. The gist of it is that when you store floats as strings, you tend to lose precision real fast. Did you know that the floating point number “0.2” cannot be accurately represented in the floats we use in our floating point hardware? It’s true and it’s not a conspiracy! It’s just how the math works out. They store the float as both a string representation and they store it as a hexadecimal integer! That’s brilliant, because you can always read the hex correctly and convert it to a float. But as I tried to implement this myself, I realized: why don’t I just make a binary file in the first place? The tool I'm using here is called 010 Editor. It's awesome. That probably looks like a big ol’ pile of gobbledygook to you. As well it should! But after reverse-engineering a great many stupid file formats, I know what makes a great file format. The most important thing of any binary format is the header. This helps identify the type of file you’re dealing with, but also the type of data. I use a PNG-like block structure, where each block has its own header. Keeping the header separate like that allows you to load the entire header in one go, without those pesky conditionals. The name variable is used to identify the block. 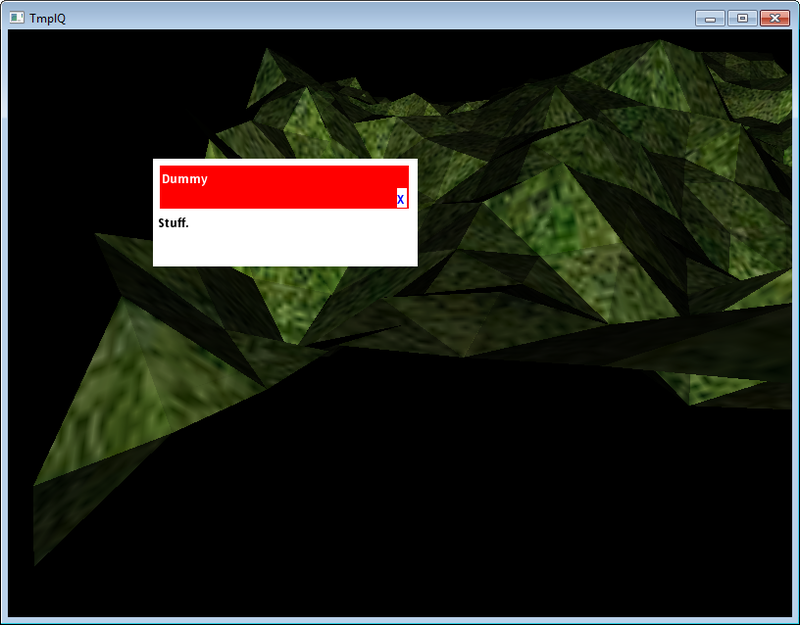 Right now I have only two blocks: “PASV” (PostApocalypse SaVe file) and “CAMR” (Camera). The first block allows you to quickly identify that yes, this is a PostApocalypse save file and it also tells you how many blocks are going to follow. The camera block simply has its data (position and rotation) dumped into the block as bytes. And that’s it. :) Surprisingly easy to work with, reliable and extensible! The version variable might seem like overkill, but it will vital in allowing backwards-compatibility. Hopefully, by the time this game reaches completion, I will still be able to convert and load this savefile. Why not just tell me: 108 prisoners. Sure would save screen estate. How many days can I survive on these food supplies? How much does each horse increase my movement speed? What the hell is encumbrance even for? 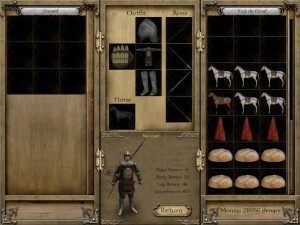 So I set out to improve upon that by designing a great UI from the start and integrating it with the rest of the game. Firs things first: that silly font rendering I had had to go. Obviously it was Windows-specific and it would be a pain to port to other platforms. But I’ve used FreeType in the past and I could never get it to render quite right. Also, I don’t want to spend all of my time designing a system I don’t really care for, so let’s take an existing package. That RockScroll image on the right side really tells you all you need to know about the GUI code. But I didn’t want to let my prejudices get in the way of progress, so I gave it a try anyway. And then I found out that you can’t really control anything. 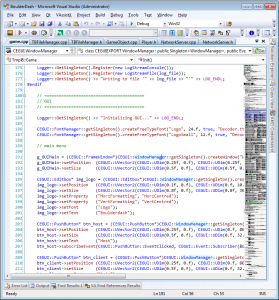 Don’t want to use XML to load scheme files? Too bad, the scheme loader uses private, not protected members. Want to use your own font render? Yeah, no, this one just works for us you know? So I decided to look at alternatives. And I ended up with libRocket, the cute little engine that could. I just want that little X to the right of that dummy text. WHY MUST THIS BE SO DIFFICULT? But overall: I really like it! 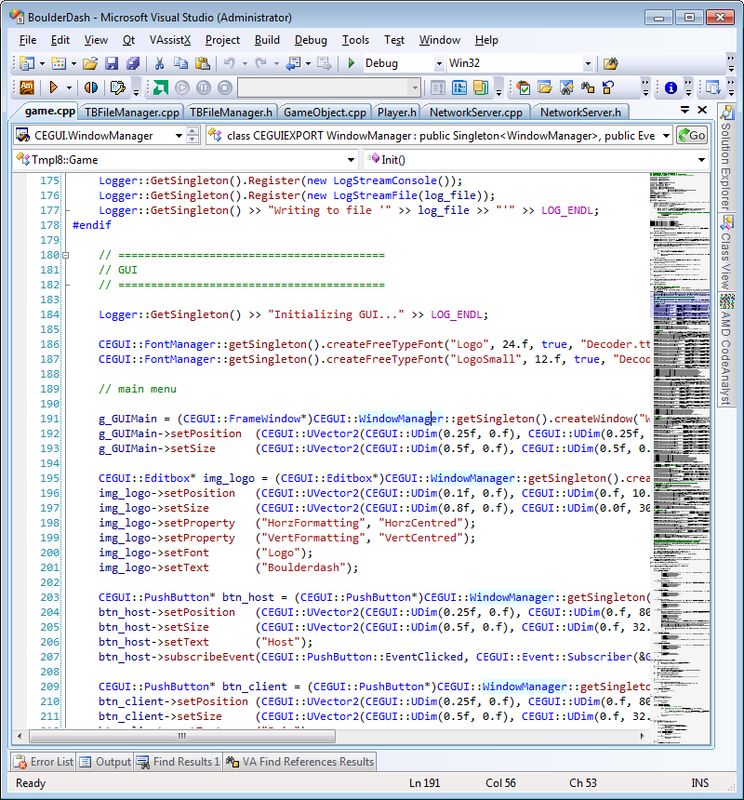 Using HTML/CSS for UI makes a lot more sense than trying to get the same results using relative and absolute offsets like in CEGUI. I’m hoping I can finally start getting some gameplay next week. I have the basic systems set up, now it’s a matter of getting more content.